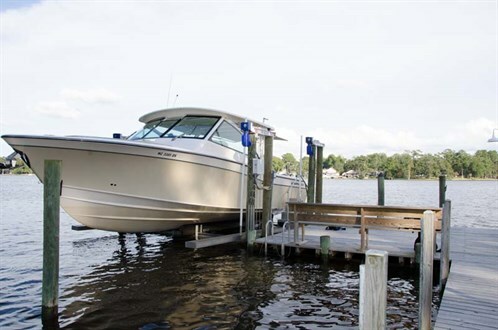 The Grady-White 375 Freedom is another quality family and fishing boat. It’s everything that is great about American boats, it’s big and brash, and our reviewer loved it. I was recently ‘forced’ into a trip to review a whole range of luxury American boats in their home country. 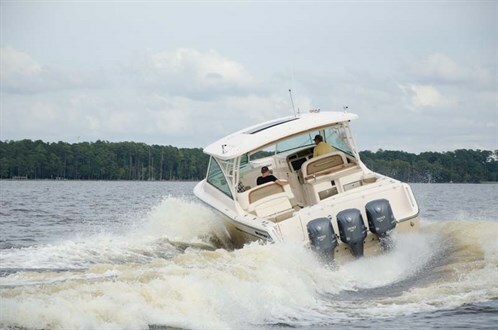 I got to head to a place called Greenville in North Carolina, to check out the Grady-White Boats Factory – and I also got to review the new Grady-White 375 Freedom Dual Console and 251 Coastal Explorer. But I got there. Upon arrival at Grady-White headquarters I received a heart-warming and hospitable welcome from the staff, along with a comprehensive tour of their state-of-the-art boat factory. It’s an eye opener – no wonder Grady-White boats are at top of their game. From the factory it was then a relatively short trip to a place called Bath on the Pamlico River, where the two Grady-White boats awaited reviewing. The first glance of the Grady-White 375 Freedom was an eye opener. This is one beast of a bowrider-styled boat, all 36ft7in (11.15m) of it. It’s a knockout of a looker. 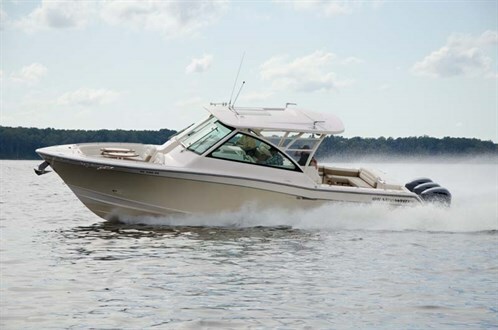 Its big flared bow rolling back into the sleek Grady lines, along with instant appeal for family boating, entertainment and of course sport fishing, makes it quite something. These boats are kitted out with some of the most innovative and luxurious features found on this style of boat. 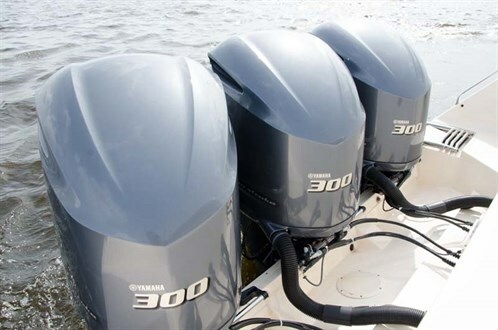 As you climb aboard, the triple 300hp Yamaha outboard set-up on the transom automatically gets the mind racing on knocking those throttles down. Access is via the transom door or side gunwale door onto the rear deck, which is a sport fisherman’s dream, with loads of space. The review boat had a massive refrigerator/freezer and aft fishbox, with digitally controlled thermostat and overboard drain, as well as a colossal fully plumbed livewell alongside. A comfortable wraparound rear lounger complements this area for the entertaining days. There’s some good tackle storage space and, below deck via a large accessible hatch, the 8kW diesel genset and further plumbing. Moving forward, there is yet another good-sized deck lounger off to port, which can be left as a straight bench or with the flick of a switch, converted into a large L-shaped bench for extended seating. Below the seating there is more storage – another good example of innovation. To starboard the outdoor mini-galley has everything you need to cook up a good feed for those onboard, with electric griller, sink and cutlery storage. It also serves as a mini-bar with fridge incorporated and even as a prep-station for baits and gear. Although situated at the rear of the cockpit and open to the elements, this area is still fully protected by the hardtop but if more protection is needed, the 375 even has a fully extendable electronic rear bimini. A slight step up then takes you to the cockpit, where the split-screen can be left open for ventilation or closed, together with the half-door, for full protection. The screens meld into the hardtop and have side clears for further ventilation on the good weather days. The hardtop is again far from something standard with built-in storage compartments, drop-down TV, speakers, rod racks and an accessible mesh pocket for lifejackets. To port another large wraparound lounger with foldaway dining table is perfect for entertaining and meal times, but could also serve as an extra bed. 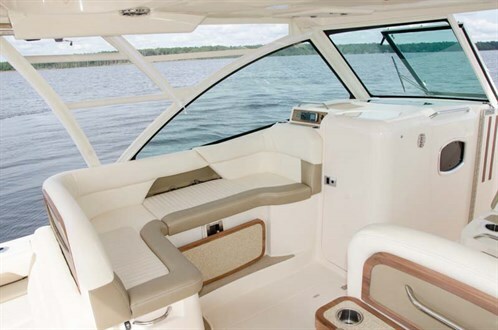 Below the dash and screen Grady has managed to take a bowrider styled boat to the next level by incorporating a drop-down cabin that converts from a lounge area to a full double sleeping section. It’s presented well, has a full six feet of headroom and most certainly would be comfortable enough to have a nap in. To starboard the captain has a super-comfortable control station to operate the boat from, with seating for two, a large dash panel loaded with electronics, good vision through the screens and (another surprise for me) a side entry into a full head with toilet, hot water shower and vanity, as well as microwave, storage and other fancy features. 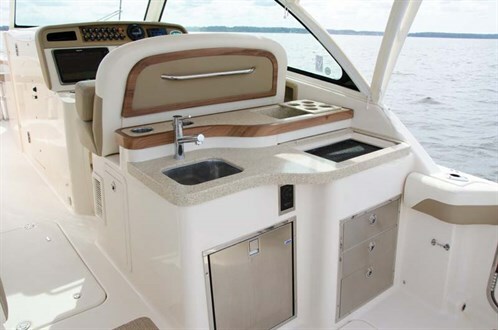 Although the full cabins are comfortable enough for extended stays on a boat of this size, standard full cabins rarely get used for this purpose – so on the Grady-White 375 Freedom you get the best of both worlds. When it comes to the Grady-Whites there is no chance in hell, or space available, to run a detailed list of all the options. It’s just one those boats that you have to see for yourself. A stand out was the Yamaha Helm Master fitted. Helm Master uses flexible, streamlined rigging that digitally connects an enhanced binnacle control, a high-definition LCD screen, electronic steering, an electronic ignition panel, a theft-deterrent system and an innovative joystick. Together these components form a true drive-by-wire system that responds instantly to your command. To put it simply, there is no need for a bowthruster when you have the Helm Master system fitted. With the simple operation of a joystick the Helm Master controls each motor separately in both gears, as well as the independent steering, enabling you to simply manoeuvre the boat by joystick in whichever direction is necessary at low speeds when docking or entering tight spaces. You can even crab the boat sideways. It’s amazing stuff, which takes the fear out of manoeuvring boats of this size and is a great option to have regardless of whether you’re a novice or experienced driver. 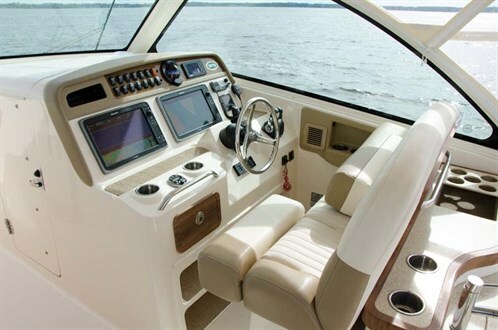 After punching the hammers down you can just sit back and relax at the helm while the Grady-White 375 Freedom triple Yamaha 300 outboards synchronise and growl their way onto the plane effortlessly. After testing the Grady-White 376 Canyon in Australia with twin Yamaha 350 V8s fitted, I must say that I don’t mind either set up as they both excelled on the performance side. If anything there is a slight difference in economy with triple outboards, but it’s negligible. What I really appreciated about these boats is the Rolls Royce feel to the drive – as operating is smooth, easy to control, and has a safe feel to it. And if you need to drive like a maniac you can, as the hulls perform more like smaller sports boats than large sport fishers when given full gas. Being a large boat the stability is really good both underway and at rest, with the ride being as dry as a bone. Honestly, it’s very difficult to fault the ride on these boats and although we tested the 375 Freedom in calm conditions, I would be happy to say that it would be a swell and chop annihilator on the big seas, judging from offshore performance of the 376 Centre Console. For the entertainers, the Grady-White 375 Freedom offers wide open spaces throughout the craft, along with enough creature comforts onboard to please all. Electric griller, bar area with fridge/freezer space, TVs, big sound systems … the list of and options is endless. For the fisherman, the Grady-White 375 Freedom is just as good, especially with the massive rear deck, complete with huge fridge/freezer killtank, buss livewell and heaps of other fishing features to suit offshore sport fishing. Having seen the full build process first hand, I can assure you that quality is Grady-White’s number one priority, and so it’s not surprising that these American boats are so popular world-wide. * Sea-trial data supplied by author. Fuel burn figures are for all three engines combined.